In February 2010, I completed my final ward round and said goodbye to my patients in Haiti just six weeks after a tragic earthquake. This earthquake was a natural disaster so devastating that within a momentary blink, a minute’s tremor and a rumbling collapse, an estimated one-hundred-thousand people lost their lives. Amidst the wreckage, hundreds of thousands more were left severely injured, shocked, traumatized and homeless. Haiti, an already impoverished nation, a victim of centuries-long political instability and the frequent rages of vicious typhoons, was now paralyzed from the head down. The world responded with an unprecedented but somewhat haphazard relief effort, an outpouring of donations, multiple celebrity appeals, dozens of emotional TV campaigns and foreign aid came gushing to help. Many health care volunteers, including myself, stumbled into the country, in a state of our own bewilderment at the enormous medical challenges before us. I traveled with a London-based organization, Hope Health Action (HHA), a charity that had been established in the country long before the calamitous events of 2010. Before the earthquake, the organization had been quietly working to improve maternity care with enormous dedication, minimal funds and negligible recognition. Despite many years of hard work, their project had barely started. After the disaster, HHA suddenly found themselves at the forefront of the emergency and became one of the only charities able to care for patients who had sustained severe spinal cord injuries. Overnight, this small group of volunteers was responsible for twenty paralyzed patients, already suffering from the horrific complications of their injuries. The facilities were exceptionally limited, being housed in a barely built maternity ward that had hastily been converted to a spinal unit. Truthfully, it was only an empty building, with unreliable electricity, sporadic water supplies, scattered beds and just a box-full of expired donations. And yet, this building became a reliable roof for these patients, having already been passed from tent to tent. When I first met these patients, I learned of their stories, and my heart was broken. I met the math teacher, the construction worker, the student nurse, the pastor’s wife, the mother of three small children, all of whom had sustained disabling spinal injuries from the earthquake. I met one patient who lost her parents, her husband, her five children, her brothers and sisters, her home and the use of her legs. And I wondered if anything else was left to be lost as I examined the pressure sore on her sacrum, down to her bone. There were also courageous stories of friendship and love in terrible conditions. I met three young women who had all become paralyzed, serendipitously united in the disarray of the relief effort and became the closest of friends. Even as they were transferred from a makeshift tent, then on to the U.S. Navy medical ship, back to another tented hospital, they refused to be separated and would only travel together. But most of all, from my time spent in Haiti, I discovered an inner belief that has stayed with me ever since. I met a wonderful group of people, patients and volunteers. They instilled in me a great belief that with the energy of love, and the addictive drug of hope, no matter how poor the circumstances, no matter how difficult the challenge, any obstacle could be overcome with heartfelt dedication, with endless, infinite hope. When I left those patients on my final ward round, I worried about their future. Their lives were changed forever, indecipherable, incomprehensible from their previous existence. I worried about their medical care and their rehabilitation, apprehensive they would succumb to complications. Even if they battled through, I wondered what lifelong disability support they would have access to in a country that could barely walk itself. In the UK, patients would be cared for with holistic health care and nationwide disability services. In Haiti, these patients only had a bed, a scramble of volunteers and sporadic donations. For seven years, I watched in admiration as HHA continued its long commitment towards the people of Haiti before returning myself this year. The field that once contained just a few scattered, scaffold-supported buildings was now a thriving hospital with a maternity unit, surgical facilities and a dedicated rehabilitation center fully equipped with a large gymnasium and disability basketball court. The hospital had become a national center for spinal injuries and was a hub for disability care in the region. The facility now employed hundreds of local staff, and I watched in admiration as a big yellow bus transported numerous bright-eyed uniformed student nurses to various hospital departments. The simple spinal injuries unit that I once knew was now unrecognizable. 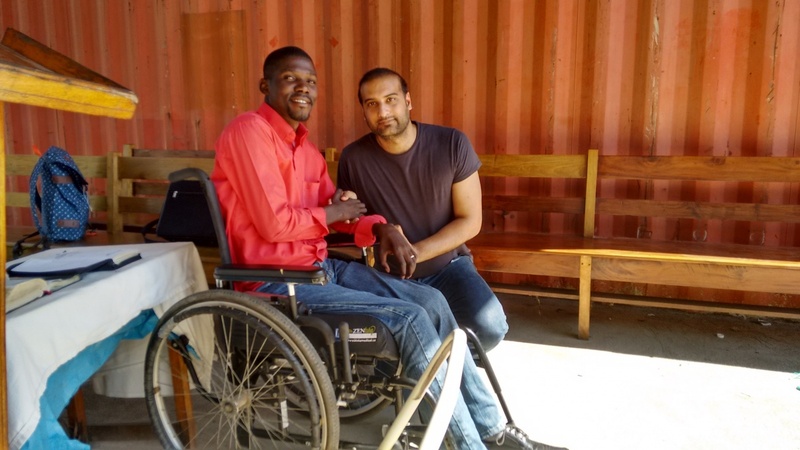 It was when I met Sam again, a young man left quadriplegic by the earthquake and the patient I worried about most, I finally knew hope could conquer all. When I saw him last, he was malnourished, bed bound and profoundly unwell. He was unable to use his arms or legs, his neck unstable, his eyes sunken. In 2017, I met a smiling, strong man, married and with a child, confidently mobilizing in his wheelchair, working as an assistant pastor, happy to see me. The transformation was miraculous and represented all that HHA had achieved and all that we can achieve joined in the future. This prescription of hope has stayed with me on my medical travels. I still recall the South African nurses singing every morning for their patients in the hope of a recovery, or the displaced people of Pakistan after the unprecedented floods of 2010, huddled together in Ramadan, hoping for a better future, or the Cambodian teenager with a football-sized tumor in his knee hoping for a solution. Hope, I believe, is an antidepressant, an analgesic, a cure and the most powerful, universal medication we have as doctors, to prescribe to our patients and ourselves. Saqib Noor is an orthopedic surgeon who blogs at his self-titled site, Saqib Noor. He is the author of Surgery on the Shoulders of Giants: Letters from a doctor abroad.